After months of mere rumors, iPhone 8 and 8 Plus finally officially introduced today, Wednesday (13/09/2017) pm dawn or about Tuesday (12/09/2017) afternoon in the United States. Apple CEO Tim Cook boasted both of these lines affirming the company's commitment to bitten apple logo to continue to innovate. "For a decade, we have always launched innovations for innovation so far we can create devices that are much smarter, more capable, and more creative than ever," he said on the launch stage at Steve Jobs Theater, Cupertino, USA. For further explanation, Tim Cook summoned Apple's Senior VP of Marketing, Phill Schiller, onto the stage. First of all, Phill Schiller explains the design of the iPhone 8 and 8 Plus which is enhanced from its predecessor. Both lines are wrapped with aerospace aluminum level with glass wrapping that processing color through seven layers. This is the first in the market and claimed to be the most durable protective glass for smartphones. iPhone 8 and 8 Plus also features anti-water and anti-dust features, but not explained the certification. The screen itself is 4.7 inches for iPhone 8 and 5.5 inches for Plus variants. The iPhone 8 duo keeps following the iPhone 7 by not including the standard 3.5 mm audio plug and the traditional Home button. One of the enhancements of their predecessors is the new look with "True Tone" that is adaptable to the color and temperature of the surrounding situation. Problem audio, stereo speakers iPhone 8 and 8 Plus is claimed 25 percent faster than the iPhone 7 and 7 Plus. His bass was mentioned more deeply. The processor relies on A11 Bionic core 6 with 64 bit design. The bottom four are 75 percent faster than the A10, while the other two are 25 percent faster than the A10. That's new from the CPU. If judging from the speed of graphics, GPU A11 more steady 30 percent than A10. Overall, 70 percent faster performance than A10. The A11 also has a new image processor with faster low-light focus and better noise reduction for its camera components. Speaking of the camera, the iPhone 8 is still comfortable with a single 12 megapixel camera that is claimed to be 83 percent lighter and power efficient. For iPhone 8 Plus, the camera is double like the iPhone 7 Plus. The sensor is 12 megapixels of quality for each camera, with f / 1.8 and f / 2.8 openings. As an improvement from earlier, there is a "Portrait Lighting" feature that enables sharper portrait photo shoot like a premium-lens SLR camera. 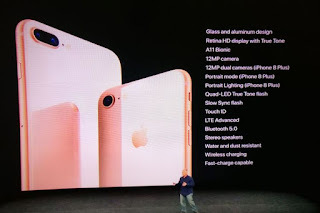 Both the camera on the iPhone 8 and iPhone 8 Plus as a whole have new sensors, deeper pixels, new color filters, and a more capable OIS, as compiled KompasTekno from live broadcast on Apple's official website. Not just for photos, iPhone 8 and 8 Plus camera is also more qualified for video recording. Frame rate on video faster with real-time motion and image analysis so it's more smooth. Its ability to record 4k / 60 fps and slow-motion 1080p / 240 fps. In addition, iPhone 8 and 8 Plus also became the first iPhone to really support Augmented Reality. The camera has a special timebar for AR with low-light 60 fps, accelerometer, and accurate motion tracking. Game lovers can rely on this duo to play with a more slick experience. 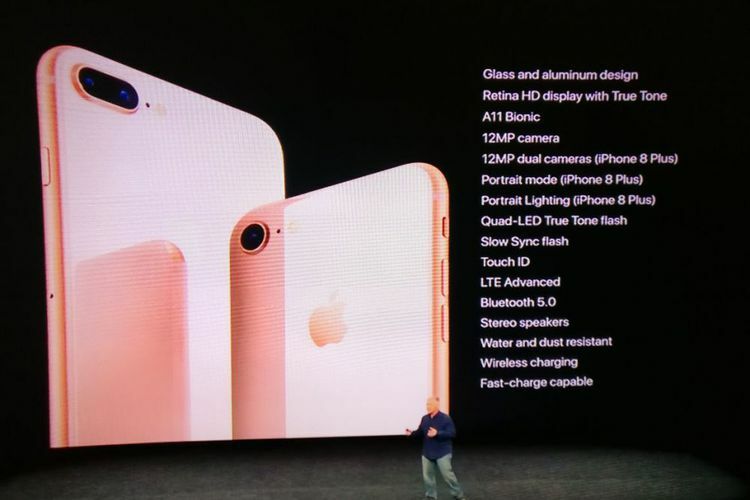 Both lines of the iPhone can start ordering on September 15 and are available in some markets on September 22nd. The price for the iPhone 8 starts 699 US dollars and iPhone 8 Plus 799 US dollars. 0 Response to "Apple Officially Launches iPhone 8 and iPhone 8 Plus"